December 3, 4, 5 & 6, 1986. Relatively Speaking; How The Other Half Loves; Absent Friends; Living Together. Ayckbourn has a flair for reproducing the rhythms and idiosyncrasies of modern suburban speech. This together with an eye for the absurd and comic situations has given rise to a series of delightful plays. All comedies, but with a keen insight into the more serious and delicate relationships in family life – and the sad lack of communications. Margaret Ockenden, who directed the Norman Conquests Play Living Together and plays Rachel in this play will direct The Anniversary by Bill MacIllwraith, Wick’s next play on February 11th – 14th 1987. This is a strong play in which a mother tries to hang on to her three sons by hook or by crook. Bette Davis played in the film. Our fourth play of the season will be directed by Karen Mulholland who last year had such a huge success with Abigail’s Party which won the Brighton and Hove Arts Festival for 3-act plays. This is expected to be Key for Two, by John Chapman, the master of farce, and David Freeman in April next. We are proud to present a strong cast of experienced players for this play, which we hope you will find entertaining and jog your memory of other performances by then familiar faces you see in the new Ayckbourn rôles. These friends will have been subject to past triumphs and profiles, but now we must welcome four of the cast who have recently joined the Company – not as novices, certainly, as Pamela Buxton and John Barham have practices the craft in other societies with great success: whilst the younger members have acted before, but not very often – because of a young family in Judith Atkinson’s case and Banking Qualification’s in Charles Porter’s. Pamela Buxton who is a relative newcomer to the area and wife of Paddy Buxton, Rector of St. Julian and St. Giles Church has joined the Wick Theatre Company quite recently. Season’ Greetings is her first appearance with Company. Previously she was involved in setting up the Saints Theatre Group, Worthing and was an actor member of West Chiltington Theatre Group and over the past 20 years has been a regular member of theatre groups wherever she and Paddy lived. John Barham was a Founder of the Centre Group, Maresfield, and also played with the Hong Kong Garrison Players. His rôles include Aston in The Caretaker, Humphrey Proudfoot in One Wild Oat, Dad in Billy Liar and Mr. Bumble in Oliver at the Gardner Centre in August 1986. He also appeared in Waltz of the Toreadors. Text Header: Christmas cracker from Wick Theatre! CHRISTMAS is traditionally the season of goodwill when differences are forgotten and, for a couple of days at least, there is a truce. 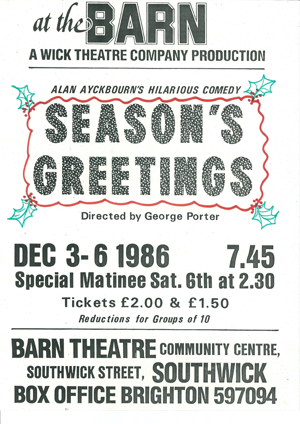 Alan Ayckbourne’s comedy Season’s Greetings, once described as a cynical alternative to pantomime, perhaps takes a more realistic look at the annual family gathering, dogged by confusion and uneasiness. Wick Theatre Company’s production of this hilarious comedy next week is directed by George Porter, one of their most experienced and accomplished producers. It is a play which strikes at the very heart of human failing and weakness, populated as it is by recognisable people from our present day suburban neighbourhoods. Rachel played by Margaret Ockenden, is a single woman adrift in a sea of uncertain marriages. She invites Clive, an author, to join the Christmas festivities at the home of her sister Belinda, portrayed by Pamela Buxton. The comedy builds up to an excruciating climax, played out variously under the Christmas tree, in the kitchen and at the foot of the stairs. Wick’s production opens at the Barn Theatre, Southwick on Wednesday and continues until next Saturday, when there is also a matinee performance at 2.30 p.m. The evening performances start at 7.45 p.m.